Aqueila Lewis talks with Candice Elder, Laksmi Lagares and Maliha James of the East Oakland Collective. The East Oakland Collective is a cohort of millennials (and other generations) invested in the state of deep East Oakland. 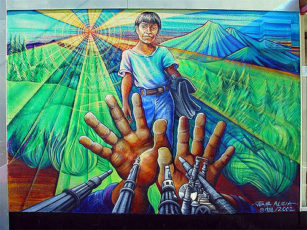 Then Julieta Kusnir of La Raza Chronicles/Cronicas de la Raza interviews Juana Alicia, whose prodigious body of work includes some of the Bay Area’s most iconic murals. Juana Alicia was one of the six artists who created the Women’s Building mural in 1994.